Minneapolis, Minn., Oct. 23, 2012 – William Yokley and his National Guard / Polaris / Coastal / Yoshimura / DragonFire /Yokley Racing RZR XP 900 took the GNCC “Open Modified” UTV Championship for fourth consecutive year with Yokley’s teammate, Scott Kiger in his National Guard / Polaris / Coastal / Yoshimura / Yokley Racing RZR XP 900 taking second. 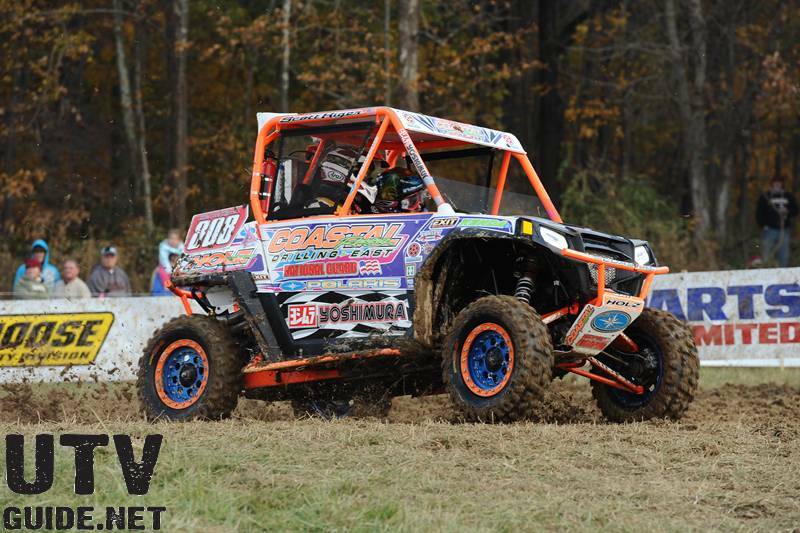 RZRs proved to be a dominant force in the class taking the top five spots for the season. The last UTV race of the season, The Amsoil Ironman, saw three RZRs on the podium for the “Open Modified” class with Yokley taking top honors. Teammate, Kiger, had an unfortunate incident where a tree became lodged between his wheel and frame leaving him in last after the first lap. Kiger was able to pick cars off one-by-one for the remainder of the race to finish fourth and seal second place for the year. Yokley Racing is sponsored by The Army National Guard, Polaris Industries, Coastal Racing, Yoshimura, Kenda Tires, DragonFire Racing, EXIT Suspension, Keizer Wheels, Holz Racing Products, Tireballs, Moto Pro Training, Monavie, March Westin, TUSK Off-Road and Big Country Powersports. Polaris is a recognized leader in the powersports industry with annual 2011 sales of $2.7 billion. Polaris designs, engineers, manufactures and markets innovative, high quality off-road vehicles (ORVs), including all-terrain vehicles (ATVs) and the Polaris RANGER® side-by-side vehicles, snowmobiles, motorcycles and on-road electric/hybrid powered vehicles. Polaris is among the global sales leaders for both snowmobiles and off-road vehicles and has established a presence in the heavyweight cruiser and touring motorcycle market with the Victory and Indian motorcycle brands. Additionally, Polaris continues to invest in the global on-road small electric/hybrid vehicle industry with Global Electric Motorcars (GEM) and Goupil Industrie SA, and internally developed vehicles. Polaris enhances the riding experience with a complete line of Pure Polaris apparel, accessories and parts, available at Polaris dealerships.